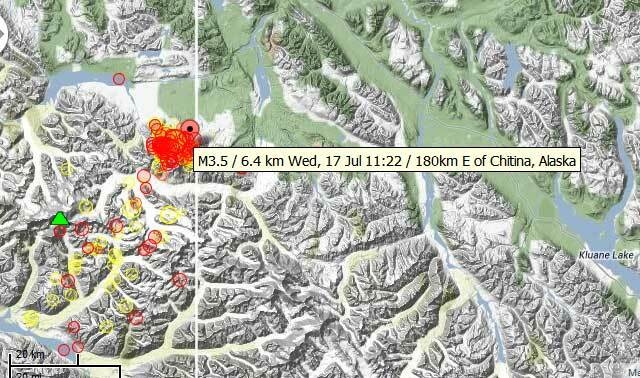 A seismic swarm with magnitudes up to 3.5 has been occurring in the Wrangell Arc about 40 km NE of Mt. Churchill volcano during the past few days. The intensity and frequency of the quakes has calmed down yesterday. While some few of the quakes are near the volcano, most are not, and the swarm is probably not linked to the volcanic system of Mt Churchill volcano. However, there is no seismic monitoring at the volcano itself, although it is potentially a very explosive volcano. Mount Churchill contains an ice-filled summit caldera 3 km wide. The volcano is the site of two large explosive eruptions in North America during the past 2000 years, but it is now exactly known when the latest activity occurred.